GREAT PHONE , NOT SO GREAT KEYPAD!!! if you can memorize the QWERTY keyboard (which I have) then your ok , oh and also the number keys are a little small . I swapped out a Motorola MPx200 (which I fried) for a Nokia 3300 initially because of the low price compared to other phones with similar features.You do get a lot of "bang for the buck" with this phone. The selling point on the 3300 is the music player.It plays MP3 files and "raw" (not MPEG-4 encoded) AAC files.Because it does not support the MPEG-4 compression, you're better of with using MP3, as the raw AAC files at the same bitrate are acutally larger in size with no noticeable difference in quality.The music player is among the best I've listened to (it actually has some BASS output) with the provided stereo headset; you can also listen to it with the single-ear (mono) earpiece and the player knows the difference and switches from stereo to mono accordingly.You can also listen to either the music player or FM radio using the loudspeaker on the phone, but to listen to the FM radio you still have to keep the headset connected, as it utilizes the headset wire as an FM antenna.I have encountered an issue where the music player will arbitrarily change tracks, or the FM radio will spontaneously kick over to another station preset, but it could be from accidental keypresses on the case that I have the phone in. This phone also includes a recorder and a special audio cable (3.5mm standard plug on both ends) for connecting an external CD player or other equipment to record from to the MMC card (64MB) supplied with the phone.The phone records 64Kbps, 32KHz "raw" AAC format (64MB = about 2 hours of audio), which is fine if you are recording from the radio or voice but not the greatest if flawless quality is your preference from your CDs.The Nokia Audio Manager 3.1 software supplied with the phone is clunky and stalls frequently; I highly recommend using RealPlayer 10 with the Nokia Mobile Device plug-in (which also handles conversion to MP3 for you); RealOne Player with the plug-in is also included on the CD that comes with the phone. If you have a separate MMC reader, you can read the cards in that rather than in the phone to speed up transfers. The phone itself is a decent quality phone, as with most Nokia handsets. However, if you don't want to look like a space alien talking on it, you'll find yourself using the earpiece almost always (otherwise, you hold the narrow back side of the phone to your face to talk; which looks tacky and feels awkward). The full keyboard on the US "B" model is excellent for text messaging and e-mail--*IF* you have light to see it with (only the call, hang-up, and directional buttons light up, which means you can't see the numbers or keyboard in the dark--major issue if you have to communicate in less-than-ideal lighting; keep a little mini flashlight with you). The 3300 supports Java MIDP 1.0, which is wonderful. Most of the apps I used most frequently on my MPx200 I have found suitable Java alternatives for (MyCast Weather, Virca IRC client, EmailViewer e-mail client, and MapQuest Mobile for real-time directions are among some of the apps I use often). The built-in e-mail client is adequate, but forces you to download entire messages instead of just headers to see what you *really* want to read (downloading full messages can consume your GPRS bandwidth in a hurry if your e-mail box is big), so I use ReqWireless E-Mail viewer, which doesn't have that disadvantage. Like all Series 40 Nokias, the Calendar is very basic with limited capability, but the Contacts database is robust.Which brings up another major issue with this phone: lack of PC Suite support.The data cable supplied with the phone only interfaces with the MMC card in the phone and not with the phone's interface itself, so if you need to synchronize via cable or use your cell phone as a modem, you'll be SOL on this device.It only supports synchronization over-the-air using SyncML with a SyncML-compliant server (again, a bandwidth hog if your contacts/calendar db is huge); Nexthaus does make a SyncML server to sync with Outlook, but any calendar items not supported by the 3300 get skipped so your calendar is always incomplete (Contacts come through great though). Lastly, you would think that with this phone supporting the MMC card format that it would also support SecureDigital (SD).It does not, and MMC cards are becoming increasingly difficult to find as more vendors make the move to SD cards.The phone comes with a 64MB card, which is sufficient for most people, but if you like more than an hour's worth of MP3s, you'll want to look for a 128MB or 256MB MMC card.I will give it this much: there is a feature to backup and restore your phone's settings to/from the MMC card, which is a smart feature to use in case your phone should be accidentally reset. Overall, I do enjoy this phone, especially the awesome music player and the java support. Save your money and look into a phone that's easier to use than this one. I initially liked this phone for its odd shape and exciting features, but now I regret my purchase altogether. I have Cingular, and the service has been pretty good. That's not the problem, but I realized that Nokia is second to Motorola when it comes to quality. I like the FM radio & MP3 features, but they come with massive flaws. You can't play the radio without the headsets in the phone which is bulky and annoying. I love listening the radio on my cell, and if you do too, then look into a phone that has radio hands-free headsets. If Nokia were to improve this phone and re-release it like they do with weak music cd's, then it would do better on the market. THE WORST PROBLEM I HAVE is with the keypad. I love the keypad, but I hate it! Full QWERTY keypad but it does not light up nor does it even glow in the dark. Don't even think you'll memorize the keys because you won't trust me! False advertising with the Express on Cases. Nokia said they would void my warranty if I were to change cases. The phone is great but AT&T has to be the worst cell phone provider ever. There network has so many dead spots its not funny and not small ones either. I got better signal when i was roaming so what ever you do do not get at&t is a big disapointment! 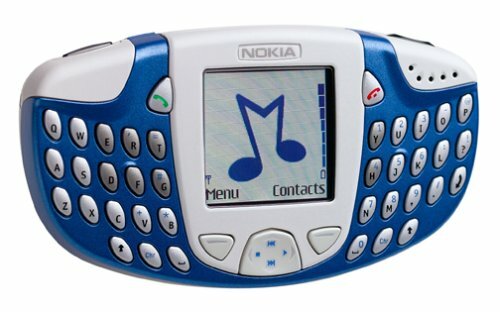 ONE OF THE BEST PHONES EVER! a good phone, GREAT volume! I really like this phone. It may be "unhip" according to some, but it's small enough to cart around in a pocket and it won't get you mocked either. Best of all, it gets good reception and after you adjust the speaker volume (must do it during a call, otherwise it adjusts ringer vol), it is LOUD!!! So loud it hurts my ear sometimes! Love it! Great for noisy situations. I got 100 free minutes through the refer_a_friend program and would be happy to explain how it works before you activate - just click on my name to email me. This is a good cell phone, if just want to talk, And not be Hip. I am using this phone for the past one year and don't have anything good to say except that it picks-up signal in almost all the places with Verizonwireless provider. The phone as such doesn't come with any extra feauters (like camera or mp3 player) and it is a very basic phone where you could save the phone number and the names.No speaker phone and the maximum volume is also not great. The connector in the charger (the one that comes with the phone) is really bad, it doesnt make good contact with the phone and many times you will see the message "unable to charge". The advertisement claim longer talk time after each complete charging with my experience i could never talk more than 1.30hrs in one continous strech.It starts beeping with the message "low battery charge".The advertisement claims 240min of talk time whereas it actually give only 180 min. After year use now it takes too much time to completely charge the phone, more than 4 hrs (my guess the battery is dying).And also the talk time is not 1.3hrs probably an hour or little less.I am struck with this phone as i have signed the contract with verizonwireless for two years. Also transferring the address book from one phone to other phone is a big hazzle as again problem with the connector provided by the motorola doesnt fit properly on the phone. Step up to some serious power and svelte portability with the Audiovox SMT5600. At just 4.24 inches high and 1.82 inches wide, it's the world's smallest Windows Mobile Smartphone. In addition to making calls, the SMT5600 lets you do things you'd typically need a PC to do, like email, text messaging, instant messaging and web browsing-- all from one integrated phone. What's more, the unit's software is designed to sync seamlessly with email, contacts and calendar information on your PC. This Smartphone also ups the ante for mobile music and video lovers with Windows Media Player 10. The SMT5600's Web browser is fully HTML compatible. Browse your favorite sites with ease. The "Today Screen" keeps tabs on all your important functions, tasks, and applications. The large 2.2-inch, 176 x 220 screen dominates the front of the device. The SMT5600's controls maximize available space on the small unit. 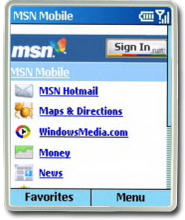 A four-way selection button allows you to navigate and control the Windows Mobile interface. Up/down keys are located on the left side of the unit for quick menu navigation. A mini-SD card slot is housed in the battery compartment, underneath the unit's lithium-ion battery. The rear of the phone sports a VGA camera with video capture capability. A power key and infrared port are housed on the top of the unit, while a universal charger/data port and headphone jack are present on the bottom. The SMT5600 has all the latest calling features folks have come to expect. The built-in speakerphone makes it easy to talk without having the phone to your ear. Voice activated dialing makes calling your friends, family and associates as easy as saying their names. The phone's Bluetooth connectivity means that your favorite Bluetooth headset is fully compatible. The SMT5600 is designed as a complete solution for people who want to bring their office with them. The unit comes packed with pocket versions of Outlook, Internet Explorer and MSN Messenger. Pocket Outlook features integrated calendar and email functions, as well as a contacts list that is cleverly integrated with the phone's dialing functions. Microsoft's ActiveSync software keeps the device synced with all of your PC's Outlook information (via Bluetooth, USB, or IR connection). Users who want Internet connectivity on the road with their laptop or PDA can select an AT&T Mobile Internet package and tap the SMT5600's wireless modem capabilities. A number of handy software tools are bundled with the MPx200 including a voice memo recorder, a calculator, a to-do list, and an alarm clock. T9 predictive text entry technology is also included. In addition to a VGA still camera, the SMT5600 is capable of recording video clips to its built-in 64 MB of memory. Memory can be upgraded to 256 MB via the mini-SD card slot. The inclusion of Windows Media 10 on the SMT5600 opens up a whole range of possibilities for this phone. Use the phone as an MP3 player. Discover and purchase more tunes via the Windows Mobile music store. Sync the device with Windows Media Player 10 on your PC to download last night's TV shows so you can watch them whenever you want. For gamers, the phone supports Java-based and Windows Mobile game downloads. It ships with Jawbreaker and Solitaire. The Audiovox SMT5600 weighs 3.58 ounces and measures 4.24 x 1.82 x 0.69 inches. Its lithium-ion battery is rated at up to 4 hours of digital talk time, and up to 140 hours of digital standby time. It runs on the 850/1800/1900 MHz GSM/GPRS frequencies. The phone comes with a one year limited warranty. I've had this phone for about two weeks now. OK, I'm no phone guru.Previously, I've owned one phone - a Samsung flip-phone for four+ years.That was a great phone, but the hinges on the flip cover had started to break after so many years, and quite a few falls too I might add. But, I can say the AudioVox is a great phone.Put it this way, three employees at the Cingular (ex-AT&T) store where I got it ALSO have one - so that's an endorsment from peope who ought to know what's good. It's very small, very light and very cool! - Microsoft "Smartphone" operating system. - Ability to have e-mail PUSHED to the device - like a Blackberry -- but the "unlimited data" plan from Cingular is only $25 / month -- which is cheaper tan for a Blackberry. - It took all my Outlook Contacts easily.Synching is a cinch! - Outlook Calendar appointments can be entered on the phone or synched -- and when ytou are in aan Appointment, the phone automatically goes into "meeting mode" (vibrates, instead of ringing).Cool! - tri-band that will work in Western Europe also! The phone is a power miser considering what it's got going on. I charge battery every 2-3 days.When I just use it as a phone, I don't need to charge for 4 days.Right when I got the phone I went online and found a longer lasting battery that the standard one delivered -- but it's so economical on power, I don't think I'll need it! Anyway, if you're looking to replace the phone you have, you might want to check out the AUDIOVOX SMT 5600.I paid $199 but I just saw it offered for free on a site that sells phones and services. I switched from Sprint to Cingular, beacuse for my work I need a carrier that offers phones I can use both in the US and in Europe (and not a separate loner or rented phone) -- And I think only Cingular carries this little guy. AUDIOVOX SMT 5600 - a feature-rich little phone! The combination of intelligent features, bluetooth, video/audio and Windows Media Player 10 make this the best phone and certainly the best SmartPhone available.With the addition of a 512 MB MiniSD card the phone will hold 34 hours of video. The only complaints are the rocker button is difficult to click. Iam yet to test more functions on the phone. Big screen and more features. Video quality is good. This phone is really a look into the next gen convergence devices you will be seeing in the months to come. Speaker is loud, camera quality is good, gprs is strong, ATT reception in houston is as bad as most people say it is. The only (im being really picky) thing missing is a querty keyboard. However it is well compensated by the great nokia style (maybe even better) T9 typing. Let me first tell you that i have researched this phone high and low..
frankly, theres nothing out at there at this price with so many features but let me tell you to keep the following things in mind which collectively made me return the phone. Compatible with T-Mobile cell phone service and pre-loaded with AOL Instant Messenger service, the Nokia 3390 also features Internet connectivity, picture messaging, voice-activated dialing, and more, all displayed on a high quality backlit black and white LCD screen. For calling, you'll enjoy call timers, redial, missed call indicator, call log, any-key answer, auto-redial, speed dial, mute control, one-touch 911, usage alert and a phone book capacity of 250 entries. Nokia also supports TTY/TDD (Telecommunication Device for the Deaf) compatibility with phone adapter (adaptor not included). I recently traded in my 3390 for a Samsung x105. I got rid of it because the battery was dying and I wanted to try out some of the new technology. My Nokia, though 3 years older, compares quite favorably to my new one. I rarely missed a phone call due to the non-polyphonic ring tones. The sound normally stuck out so I could often hear it upstairs and over a blaring radio. The vibration feature is powerful so I always felt it. Overall, it was simple to use and practical. Newer phones often have so many useless features, that it actually takes away from the phone. I miss this phone. Aside from the dying battery, I have no major complaints about the 3390. I'm definitely looking to buy another Nokia in the future. Hopefully it will live up to the same standard. This is the best phone I have ever used.Even though we have so many new phones in the market.This phone still can compete with them.A cell phone shold work like a phone not as a camera or anything. If you are looking for best performance phone then go for it. Iv'e had this phone for a little over a year now and only recently have iv'e been getting problems with it. The problems are when your in a call the phone will just hang up or all of a sudden get a bad echo which gets irritating. I probably cause the problems though after countless droppings, getting stepped on and much more. The phone works great has games for those who plays them, has IM for when you want to text somebody. So yea it has a little more than the essentials of a phone. You can customize it by changing faceplates or even downloading a tone or two. So yea I do recomend it if you want a phone that you dont want to worry bout getting a hit or two like these new color screen phones. I really dont know why you want a phone to half the stuff that they do and there so fragile I already know three people who broke the screen on those phones and in my opinion are just more trouble than there worth. STAY WITH THE BASICS YOU'LL LIKE THIS PHONE!!! Well NO matter what someone says it's one of the best phone from Nokia. I agree very basic .. not fancy stuff like camara and GPRS and WAP but it got AOL messenger. This is a very good phone. I have had it for a couple months now, and i can't really find any real fault with it. For its small size it is packed with features. It has a large bright color screen which is readable in daylight. It uses EGPRS for fast internet, and in my area, ATT/Cingular has good reception for clear calling. It can operate at 850/1800/1900 frequencies which enables use essentially world wide. The speakerphone is strong and loud, and there is a voice recording feature also. Despite having features of an advanced phone, Nokia has retained its trademark user-friendliness in this phone. Scrolling over a feature with the 4-way nav button activates help text for information. Additional perks include MMS, polyphonic ringtones, and FM radio with headset included in the package. The drawbacks are small keys, but within a week, using the keypad seems like old hat. Unfortunately it does not have a camera, but this was a generation before camera phones came out. Dust tends to collect under the screen over longer periods of time, but can be cleaned by opening up the external case. I invested in a cheap (made in china) leather case and since then i have not had dust problems. Overall this is a solid phone with features designed for serious users. People wanting cameras and mp3 players in their phones look elsewhere. Purchased the 6200 as a replacement for the horrendous 3595 offered by AT&T wireless as an introductory GSM phone.The 6200 signal/voice quality blows the 3595 away. The ergonomics are awkward for those with larger hands, but after a few days of use, the keypad is tolerable. This is a great phone, and I was distraught when I realized that I had it on when I jumped in the pool for a couple of minutes. When I took the soggy handset in to get a replacement, I found out that Cingular didn't carry them anymore. Luckily, a rep there was nice enough to sell me her cherished 6200. Two weeks later, I thought I'd just test the old swimmer one more time, and IT WORKS!!! Now I have a backup for my next stupid move, and even more admiration for Nokia phones. true to the NOKIA name! You know what?I don't know when people don't just buy Nokia's and make themselves happy.I see all these bad reviews on some of the 'coolest' and 'newesr' phones out there with all these bells & whistles but one thing the other companies forget it actually making it functional enough so the end user isn't pissed off all the time ... I don't get it! The point is FUNCTIONALITY.I say the above statement because I temporarily got ployed into the new high rez screen flip camera phone nonsense that's going on out there. First off, I've purchases 2 plans and 6 lines of service with AT&T over past 3 months ... NO COMPLAINTS.What I did was I purchased through all the online web sites that offer money back to you to buy the phones and plans.First one with letstalk, then cellular choices.Both excelent.I tracked the progress of my phone and the shipping, total took 4-7 days for phone activation and shipment.One was with brining my number over also.So overall, time wise was great. Shipment came fine, no problems with phones etc.Coverage also great.Coverage goes hand in hand though, bad phone gives bad reception.DON'T BE QUICK TO BLAME AT&T. When I got my order I got the Nokia 3200 - great phone by the way, you can see my review on it but it's ugly.I sold it and got the NEC 525.OMH BAD MISTAKE.Dropped calls, calls overlapping eachother, little and to poor reception.I actually lucked out and was able to SWAP that with a Nokia 6200.I have been so happy since.Not once have I had a dropped call or bad reception ... NOT ONCE!Same carrier, same location, different phone ... I makes a world of difference and I believe part of that is because it is TRI-MODE.The guy I swapped with worked for Nokia and wanted a flip phone.I talked to him two days later and he said "This is a nice toy to play with but I'm going back to Nokia in a week or so" and he did! - EDGE reason for such strong reception, very little nokia's have this! The Nokia 3200 is all about fun and self-expression while you're on the go. Fun features include a built-in flashlight and an FM radio. Specialized "cut-out" covers allow you to design your very own faceplate designs. On a more serious note, the 3200 is a powerful GSM phone with advanced data and messaging features, plus a built-in still camera. Don't let this phone's wacky looks fool you. It's made tough for a rough and tumble world, while maintaining a style all its own. The front of the phone sports a 128 x 128 color LCD display. The button pad features large, easy to press buttons. An internal antenna means there's nothing to snag or break off. The rear of the phone houses a CIF-resolution camera (352 x 288) camera, which is surrounded by a panel that can be removed for placement of "cut-outs." Personalizable cut-out panels are designed into the front panel, as well. You can design your own covers and slide them under the cut-out panel to personalize your 3200. Lastly, an infrared port is provided for data connectivity between the phone and your PC or other phones. The 3200's phone book can hold up to 500 contacts with multiple entries per contact. It also features a speakerphone for easy handsfree talking. The phone features built-in polyphonic ringtones. 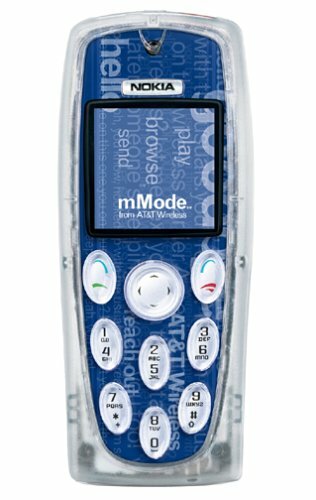 More ringtones can also be downloaded from AT&T Wireless' mMode service. Pictures of your friends (or enemies) can used as caller ID alerts. For those times you want to keep things discreet, there's also a vibrate ringer mode. Speed dialing can be programmed for up to eight contacts so you're always one button away from your most important numbers. Finally, the phone keeps tracks of your last 20 calls. The 3200 is a powerful mobile messaging tool. Support is built in for sending and receiving text, pictures and sound via messages. When used in combination with the phone's built-in camera, MMS opens up a whole new world of messaging fun. Instant messaging (AOL Instant Messenger, ICQ) is also supported and the phone ships with a built-in email client (AT&T messaging charges apply). T9 text entry, which is a technology that makes it easier for people to enter words and text on handsets, is built into the unit-- a plus for mobile email and text messaging users. Getting on the Internet is easy with the 3200. It supports the GPRS protocol, as well as the new, high speed EDGE data protocol. AT&T's mobile mMode service lets you receive and send emails, read news headlines, get sports scores, download games and ringtones, and more. A number of handy software tools are bundled with the 3200 including a voice memo recorder, a calculator with currency converter, a calendar, and an alarm clock with snooze and a countdown timer. Nokia offers a free application on its website called PC Suite that facilitates easy synchronization of contacts, calendar events and other data between the phone and your PC. Use the 3200's camera to capture stills and then send them to your friends via MMS messaging or email. With an optional stereo headset, you can listen to tunes on the phone's built-in FM radio, which features 20 station presets. The phone also supports custom themes and wallpapers. Java support is built into the 3200, making it a powerful gaming companion for both online and offline games. The phone ships with three games, Bounce BlackJack and Virtual Me. More games are available via the AT&T mMode service. The Nokia 3200 weighs 3.17 ounces and measures 4.23 x 1.77 x 0.81 inches. Its lithium-ion battery is rated at up to 4 hours of digital talk time, and up to 288 hours of digital standby time. It runs on the GSM/GPRS 800/1800/1900 frequencies. The phone comes with a one year limited warranty. It's bad enough that "The merger" has cost AT&T customers extra money and hassle, but it's really sad that when I dropped this phone and the screen died, I had to buy a WHOLE new Motorola phone. 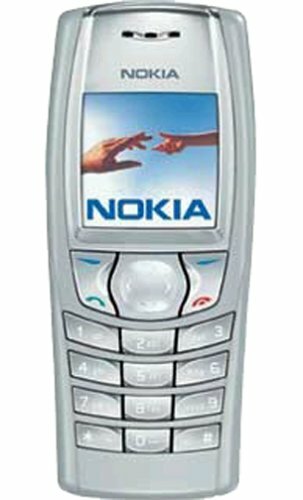 This Nokia was a pretty nice little phone for the 5-6 months I had it.The reception was pretty good and i really appreciated the loud ringtones. However, physically speaking, this phone left a lot to be desired.The plastic cover tends to scratch very easily, even though the only places it ever sat was on my desk, in my pocket, or in the console of my car. I love this phone. I got it for my birthday 3 months ago. I decided to give it 3 months before a review now here it is. Voice recording is only for 1 minute! Well those are my pros and cons and this is a cool phone, much better than my old Nokia 3410 because it was'nt even a camera phone but now I have a camera phone like everyone else! It is decent and I could keep my Nokia 3410 number which was easy to remember because I had 2 sim cards because when I had a Nokia 3410, I accidently messed up the security settings on it and typed the wrong PIN code 3 times so the phone ended up being permanantly blocked and my 1st number was almost impossible to remember without looking in your phone book. Anyway I reccomend u buy it because it is cool and instead of having a plain walpaper with no colour on my Nokia 3410 I have Ray Mcoonie of Little Britain as my wallpaper! LOL!Buy this phone for a better version of the Nokia 7250i! Buy it immediatly! I love this phone, i took too much advantage of it whule i had it, it died 3 mnths or less after i got it but i sent it back and the company didnt even look at the damn phone so they just sent a brand new one! lol im so excited! overall i love this fone! This is a great phone. I got it as a Christmas present and have been using it for about a month now. There are mnay handy features my favorites are the flashlight and the radio. Although the camera's resolution is pretty low it still functions well by means of sending pictures to your friends or attaching to phone numbers. This phone also draws attention among the endless stream of silver flip phones.Overall this phone is good for anyone who uses thier phone to its maximum potential. 1. Excellent reception and voice quality. 2. Decent price without any new contract, just buy it off the shelf. 3. Good feature set with a nice color screen, FM radio, speakerphone, camera, fun faceplate cutouts, etc. 4. New fresh design with funky keypad and translucent cover. Stand out from the crowd of similar looking flips. 5. Headset, fast charger and a decent manual included. 6. Intutive menus and fast text messaging with T9. 7. Very good battery life. 8. Includes "Bounce" a pretty decent game and possibility of downloading more. 9. Easy to unlock for use on any GSM network. 1. Features are more geared for use by young people and not business users. 2. Camera quality is poor, as is the case with most of other phones on market now. 3. Works only in USA, Canada. No GSM 900/1800 bands on it. Sporting a silver aluminum casing and a sturdy flip design, the trimode Motorola V60i combines an intuitive user interface with handy features such as caller ID, voice-activated dialing, and SMS messaging, making it an excellent choice for basic day-to-day business use. With theV60i, Motorola kept all that was good with its predecessor, the V60t, and added some impressive upgrades such as interchangeable faceplates, the option to download ringers, as well as a few new games. Tiny is the trend these days, and the V60i fits right in, measuring a minute 4.11 by 1.81 by 0.83 inches, and weighing only 3.4 ounces. Once the phone is flipped open, it feels quite small, but still is remarkably comfortable to use, regardless of the size of your hands. At first glance, we were struck by the phones stylish exterior. Constructed of a lightweight aluminum, the casing feels solid, but not clunky. The casing is also highly resistant to scratching, unlike the plastic design of similar counterparts, and held up very well when we dropped it on an office floor. The external LCD screen is another welcome feature, with caller ID alerts that did not require flipping the phone open. The headset jack is on the very top edge of the phone, a nice touch that keeps the headset cord untangled during use. With a special stereo radio headset from Motorola (sold separately), the phone can access FM radio. Compared to other phones this size, the V60is stub antenna did seem a bit large, making it difficult to slip the phone into a pocket comfortably. Once we flipped the phone open and hit the power button, it took only six seconds for the phone to power up completely, the oval-framed four-line screen revealing improved graphics and quick access to the phone book and message menus. The keypad is comfortably designed, with the keys nicely spaced and just slightly raised, making for fumble-free dialing, while still maintaining the phones thin profile. Some phones tend toward top-heaviness when open, but the V60i is nicely balanced--a definite bonus for the thumb-dialers out there. Such balance is also important for accurate use of the phones side panel buttons. The buttons on the left side of the phone control call and ring volume, including the ability to discreetly silence a call or switch the phone to vibrate during a meeting. The button on the phones right side controls two different voice features. A quick press of the button activates voice dialing, while a press-and-hold move activates the voice recorder. Three buttons below the screen and just above the numeric keypad basically control the phone. The key under the left corner of the screen gave us quick access to the phone book, and pressing the right key brought up the phones message menu, which keeps a listing of voice mail, text messages, and e-mails close at hand. The centrally located Up/Down key made scrolling the phones menu simple, and we were able to choose from a list of seven options fairly easy. That said, browsing the menu is not overly intuitive, and while this new interface was designed to give the user the ability to customize the menu to his or her needs, it could still use a bit of improvement. It took us quite awhile to figure out how to set up the voice-activated calling and short-cut features. How to delete a name from the address book was a mystery for longer than wed like. Once we got voice-activated dialing set up, it was fun to use, and the sound was crystal clear, allowing us store up to 20 names for voice-activated dialing. The shortcut feature was new to us, and involved preprogramming a number or voice command that connects directly to any item on the phones menu, such as the date book or phone book. We were able to create a shortcut after some practice, programming the "1" key as the hot key to access the date book. We also recorded the word "date book" as a voice command to reach the same feature. By taking the time to sit down and preprogram the phone with similar shortcuts, and combined with the use of a headset, the V60 becomes almost completely hands-free. The V60i also features a handful of other tools tailored for the business user. Besides text messaging, voice mail, and e-mail, it also works as a memo recorder. The voice-notes program lets you record notes to yourself, and the notes are saved for your aural perusal whenever you need them. To record a voice note, we pressed and held the button on the right side of the phone, and we were able to record a 20-second message. The phone is can hold about two minutes of voice notes, which is fine for recording ideas on the way to the office. Many of the phones personalization features, including the short cuts, quick-dial programming, date book, and even the ring settings, seem ideally suited for use in the business world. Our phone included 26 different ring tones, ranging from beeps, to sonatas, to funk (we were fond of the Uh-Oh ringer), along with five vibrate patterns to help you silently differentiate between voice mails, text messages, and calls. The V60i includes PIM functionality, and you can buy the TrueSync software and cable from Motorola to synch info on your phone with the calendar and phone book on your Windows PC. The one major business tool missing from the V60i is a wireless Web browser. The V60is battery life was consistent with Motorolas guidelines of 240 minutes of digital talk time, and 190 hours of digital standby time--good battery usage for a phone of this caliber. With no games or Web browser to drain the battery, charging the phone is a pleasantly rare occurrence. On the whole, we find the Motorola V60i a solid, practical phone, ideal for the business user, and a refreshing addition to the AT&T Wireless phone family. When reading our reviews, you should view the test results of mobile-phone battery talk time and standby time as relative information only. Many variables,including carrier signal strength at your location, signal consistency (including incoming and outgoing calls), display and ringer settings, and battery charging methods and history, will affect performance. When handset manufacturers and mobile phone carriers list talk-time and standby-time ratings, they usually include disclaimers about variable performance and often refer to the times they publish as maximum times. Some quote expected battery life ranges, and in this case you're probably safe to assume you'll experience at least the minimum rated range. Note that manufacturers of dual-mode digital and analog handsets publish battery-life rates for both digital and analog modes, as analog mode consumes much more power than digital mode. Our Tests: We tested digital-mode talk and standby times with each phone. Prior to each test, we fully charged the phone's battery according to the manufacturer's directions. To test digital-phone talk time, we turned the phone on, established a digital carrier signal, dialed a number in our test lab, and,when the call rang through, took the receiving phone's handset off the hook. When all went well, we didn't do anything else except record the time when the phone died. In a couple of cases, the phones lost the signal and dropped the calls. If we were right there and could redial, we did so immediately and continued running the test. Otherwise, we halted the test, recharged the battery, and started the test over. Assuming consistent carrier-signal strength, this test should represent best-case talk time. And it's worth noting that several phones' talk-time performance significantly exceeded the manufacturers' ratings. To test digital-phone standby time, we turned the phone on, established a carrier signal, and left the phone in standby mode. We checked the phone everyfew hours (for what was often days on end) until the phone finally cut out. Since no outgoing or incoming calls occurred during testing and because thephone was not moved, this method should represent best-case standby time, again assuming consistent carrier signal strength. I bought this phone because it was unique. Alot of my friend love to play around with the camera/video, and I don't see very many people walking around with this phone eihter so you'll definetly catch some attention when using it in pulic. I didn't even know of the real capability of this phone until I played around with it. BLUETOOTH-This has been the biggest pro for me so far. I can send pics, ringtones, files etc. between my phone and computer at NO COST at all. This is great because it saves money by emailing jpegs from your computer rather then sending viaMultimedia Message. I can also use wireless headsets with this. What I really like about this feature is getting REAL VOICE RINGTONES. Even though it won't play MP3'S, I simply convert MP3'S to AMR files on my computer and send them via bluetoooh. It's not the best quality though, but it's something. VIDEO/CAMERA-These aren't the best quality pics/vids I ever, but they look pretty decent compared to other camera phones. And just the fact that it even got video makes it unique. Infact I managed to download a program from the Nokia website that updates the video recorder to include sound (some people say they don't have sound with their video). I use the camera to take pics/vids of all my friends, and up close the pictues come out pretty good. Only con about this is that the videos are short(9-15 sec. ), and there is no zoom in feature. The only cons I can think of is that sometimes when I'm on the phone with someone and 2 or more incoming calls show up, the phone will shut down and restart. As for the loudness of ringtones, I don't even use the default ringtones cause I get real ringtones, which sound off just fine when I get incoming calls. I have a bit of a problem though with turning on and off the Vibrating Alert. When I try to turn it off, it'll turn off and even stay off when I try to turn it back on. Plus it takes about 30 seconds just to turn the phone on, but these aren't major problems. And the size doesn't bother me at all, it fits perfectly in my palm and it doesn't take up space in my pocket, I simply use a belt clip. I have had this phone for well over a year now, and have considered upgrading several times to a smaller phone, but each time decided against it as this phone has every feature I could want.Even Motorola's new top-of-the-line RAZR phone does not have a slot for a SD/MMC card, and the phone is priced at about $500! This one has a card slot and it is two years old. That speaks volumes about the feature-richness of this phone from Nokia. I am giving this phone a 5 star rating based on the features.Everyone knows this is a large phone- that is not a secret.It has the MMC slot, the Buetooth capability, infrared, in short, just about everything you could want in a phone, without an ultra-compact size.But can it really be expected that a phone with nearly every conceivable function will also be the smallest? Not likely. Love the phone.I find that the large size fits perfect in your palm and can even be used to prop on your shoulder, unlike many cell phones.There are so many features on this phone, I lose track of time when playing with it. Now, to the one complaint.The ringtones are not very loud.When I test them they sound great.But when I apply them to a contact and get an incoming call; it is much lower than before.If it is something I have done wrong, please any current users let me know!And yes, I have done the obvious and turned the volume to the fullest. Nokia advertises "Synchronize your phone book, calendar and to-do list with your PC using Nokia PC Suite 5" on the 3620/3650 phones, but the PC Suite application does not support Office 2003.This was one of the biggest selling points of the phone to me, and I can't use the most popular Personal Information Manager (Outlook 2003) with my phone.It worked with 2002, but 2003 is not supported. Nokia claims this is because "this PC Suite version was made before Microsoft released Outlook 2003:.This is ludicrous.Office 2003 was in Beta (March 9, 2003) long before the Nokia 3620 was released (October 9, 2003). The development effort could have been completed before the release of the phone (and the supporting PC Suite application) in anticipation of the new (and, of course, widely adopted) Office suite. Furthermore, Office 2003 was released less than 2 weeks (October 21, 2003) after PC Suite was released. Compatible with AT&T cell phone service, the ultrathin LG G4011 phone runs on dual-band GSM service, and features GPRS-class high-speed data download, a WAP browser, EMS, and more, all displayed on a backlit 128 x 128 grayscale screen. For calling, the phone provides a voice mail button and indicator, volume select/display, call timers, redial, missed call indicator, call log, any-key answer, auto-answer, roaming indicator, speed dial, phonebook look-up, phonebook scroll, mute control, no-answer transfer, usage alert, call restrictions, vibrating ring, and differential ring, as well as a phone book capacity of up to 100 entries. You'll also get SMS two-way text messaging as well as other useful Web features via the phone's mMode Internet access. if you're looking for a good basic phone, then this phone would work perfect for you. don't listen to the negitive reviews. it's light, nice style, and very easy to use and extreamly cheap. if you want to save money, then this would fit u perfect. i have an ipod and a great digital cam, so who needs mp3 or cam feature. use your phone as a phone and look cool too...great phone right here. I don't plan to use the internet features of this phone. I wish it was sturdier. It cuts in and out way worse than our old one. You can't squish it to your head and the headset is unnerving to use in a room with other people. If you treat your phone really nice, only talk outdoors and for short periods of time, this might be just right. I no longer picks up my phone, because I never hear it ring,nor do I feel it viberate! The short cut bottom on the side of the phone switches it from viberate to loud ring, or the opposite way with no regard to your wish. I have had trouble hearing the ring on the street, quieting down its sudden burst in the concert hall is challenging as well, although the "old-fashioned" ring tone is really cool. :-) This is about the major shortcoming of this phone, but this shortcoming happens to be a major function and discipline of a cell-phone. Battery life is quite short - I only use the phone max 10 minutes a day, and I must charge it every other day, otherwise it dies with no warning. 3 very good thing about this phone: it's light, picks up good signal, and it's fast. I wish the display is a little more attractive, and I don't have to flip the phone open to see who is calling, and easier in-put method. Besides that, it's a practical basic phone with good price. WARNING: AT&T representatives ("Dawn: R361" and "Max: N360") themselves said during my troubleshooting (as detailed below) that I should NOT have bought through Amazon, and that they have received a barrage of complaints from Amazon buyers!I still really like Amazon, but they're integration with AT&T is non existent.People should not have to wait 2-3 days for service after they receive the phone.Buy the same phone on Amazon, but a different carrier. While this phone's claim to fame is its 1.3 megapixel still camera, it's also a full-featured phone with a speakerphone, an airplane mode and support for Sprint PCS vision wireless Internet services. The 8920's traditional clamshell form factor sports a large 128 x 160 display with a stunning 260,000 colors. A supplementary 96 x 64 color display on the outside of the cover displays picture IDs, call information, battery life, time of day, signal strength and more.An extendable antenna is located on the top right side of the phone while the phone's 1.3 megapixel (1280 x 960) camera unit is housed on top of the phone. A unique macro switch allows you to capture incredible detail in shots that feature very close subjects. A quick camera button, as well as up/down keys for volume control are located on the left side of the phone. Most of the phone's features and on-screen menus are controlled by a five-way center button above the handset's dial pad. A 2.5mm headset jack is also provided, as is a USB-compatible data connector. The 8920's built-in address book allows you to store up to 300 entries, with each entry storing up to five numbers/addresses, for a total capacity of up to 1,500 numbers and up to 300 email and Web addresses. You can customize your caller ID by linking a downloaded image or photo to a specific phone number in your phone book. Choose from 11 multi-chord, melodic ring tones and eight traditional ring tones, including a vibrating alert. The 8920's GPS location technology pinpoints your exact location when you dial 911 (where available). Perhaps most importantly for users in rural areas, the 8920 is a tri-mode phone, meaning it can operate on Sprint's digital PCS network, as well as analog networks that serve many outlying areas. The 8920's speakerphone lets you talk handsfree wherever you roam, while the phone's voice dialing function makes calling as easy as saying a contact's name. An integrated airplane mode turns off the unit's phone functions while still allowing you to use phone's camera, tools and games. The phone supports text and picture messaging for sending and receiving high-quality photos and quick notes to friends and colleagues. (Sprint PCS messaging charges apply). T9 text entry, a technology that makes it easier for people to enter words and text on handsets, is built-into the unit-- a plus for text messaging users. As mentioned the 8920 supports PCS Vision services, including email and instant messaging capabilities. Sprint PCS Vision transforms the wireless experience from something that's simply functional into something visual, entertaining and highly personalized. MSN Hotmail, Yahoo Mail and AOL Instant Messenger are all supported by Sprint's PCS Vision service. PCS Vision mobile Web services let you check out sports scores, get your seven-day forecast, check your flight status, and stay up to date with the latest news. Experience full-color graphic versions of popular Web sites. For business users, the 8920 offers something special. Sprint PCS Business Connection service is supported by the phone and it gives you secure, remote, real-time access to Microsoft Outlook or Lotus Notes information-- including email messages and attachments, calendar, business directory and personal contacts. You can also respond to meeting requests, access documents stored on your desktop PC, and view email from Internet email accounts, including Sprint PCS Mail, Yahoo!, Earthlink and more. A number of handy software tools are bundled with the 8920, including a calendar, a calculator, an alarm clock. A voice recorder lets you record up to 60 minutes of voice memos. In addition to a macro mode, the 8920's 1.3 megapixel camera includes a built-in flash, self-timer, and a 8x digital zoom capability. You can also choose from five different picture resolution settings. With PCS Vision service, you can download games like Tetris and Pac-Man, as well as additional ringers, screensavers and backgrounds. The Audiovox CDM-8920 weighs 3.88 ounces and measures 3.40 x 1.85 x .90 inches. Its lithium-ion battery is rated at up to 3.5 hours of digital talk time, and up to 168 hours of digital standby time. It runs on the AMPS 800/CDMA 800/CDMA 1900 frequencies. The phone comes with a one year limited warranty. *	To be fair, I liked about the phone the camera resolution and the zoom, but it is very slow even on the least resolution. *	The camera shutter response is very delayed, that makes it very hard to capture some thing moving even in low speeds. *	The phone got a good voice dialing feature but the phone, for some reason, becomes deaf after using the feature for some time.I discovered that the phone gains its hearing-abilities after you erase the recorded voice dial and re-record it. *	You can not add your wife work phone and mobile phone to the voice dialing.It has to be only one entry. *	The headset volume is very inconveniently loud.And when you try to lower the volume, it goes down but to a certain level.That level is still too loud that can damage your ear drum especially if you are using these silicon headsets from Jabra. The quality of the sound of the earpiece speaker, the speakerphone and the ringer are simply the worst I have ever encountered. Elevating the volume of any of these causes significant amounts of distortion. The earpiece is also very poorly designed in that moving the phone in the slightest will cause total occlusion of the sound, so the phone must be held almost perfectly still. The camera, although rated at an impressive 1.3 megapixels, renders images that fall well below expectations of such a relatively high resolution. The phone has a very competitive feature set, but few of the features perform satisfactorily. I returned it after 10 days of disappointment, and was told by the unsurprised Sprint representative that despite the phone's newness, the return rate was already quite high. In its place, I purchased a Sanyo 8200 with which I am absolutely satisfied. The only good thing I can say about the Audiovox phone is that the display was bright and clear, and had extremely vivid color. Don't be tempted by the rich set of features - pass on this phone. It's okay, but mine choked. The reception on this phone works well in L.A., but mine choked and wouldn't reboot after 4 months--all I was doing was assigning images to the contacts in my phonebook. A Sprint store replacedthe phone (which was still in warranty). But what is truly appalling is that there's no way to download the photos you take to your PC (that I know of) without hacking the phone and getting a mysterious data cable that may not even work. SHAME ON SPRINT for forcing consumers into buying their ridiculous $15 per month minimum just to get the photos out of the phone. The only reason I chose this phone was because it had the highest megapixels available at the time in a cell phone camera. Sigh. Verizon is doing the same thing: pay extra for this... when all you want to do is get the pictures out of the phone. Ugh. You might want to think twice about buying an Audiovox phone. I've had one for 2 1/2 months now. Well, I've actually had it only 2 months. It took a little over two weeks for the company to repair it when it stopped getting any signals. But, less than 24 hours after I got it back the phone another problem! This time with the keypad. Audiovox won't let the dealer replace it. It's gotta be sent back again. So, bad quality, bad repair, and bad customer service. Buy at your own risk. I have had this phone for about a year now.The features are pretty good.You get to use profiles, which i would say is the best thing about nokias in comparison to other phones.The phone's construction is very good, I have dropped it at least ten times, in the road, on the sidewalk, etc and it has held up well.It seems flimsy at times (but not weak) because the "xpress" covers are very thin, so you get some rattling and noises when you press the buttons every once in a while.The phone may also come apart if you drop it but it is very easily put back together, and everything has always worked fine.I am currently switching to a samsung flip phone (i miss the flip), but i am definitely hanging onto this phone because i have a feeling i might end up wanting to switch back.I'm not going to talk about "reception," because that depends completely on where you are and what company you have, as long as your phone isnt a complete piece of garbage. Why no normal ring tone ??? This is a good little phone, nice features, perfect size, great extras.However, I do not understand why it does not come with the choice of a basic, normal ring tone.It only gives you a choice of different songs to use as ring tones.This is incredible, why does the company assume that everybody wants a phone that sounds like a jukebox?There are many of us who only want a normal, old-fashioned ring sound on our phones.This is definitely the phone's worst design blunder. As a Suncom subscriber, I find this phone to be a great color ombile phone. One of the best things about it is it's compact size and incredibly light weight.Even at such a small size, it's easy to press the buttons and make calls. It very rarely drops or gievs me static. A lot of people are giving it bad reviews and complaining about the lack of software for transferring their contacts.This has nothing to do with the phone, but rather their service provider, and shouldn't reflect in a review for the quality of the phone.Suncom/ AT&T do not allow use of downloadable ring tones or the Nokia PC Suite software, so if you have a plan with them, you'll have to transfer all of your contacts manually, and do this again when you get a new phone. A couple of flaws I've noticed with my phone, is that it has no headset connection.Instead, it comes with a "speakerphone," that allows you to press a button and route sound to a built in speakerphone.When I heard about this, I thought it would be great for using in the car. I could just lay the phone on the seat next to me and talk without holding it.However, the speakerphone is pretty much worthless.Whenever I use it, it acts more like a walkie talkie, because the quality of sound is too poor to hear people, and the microphone is so weak that no one you talk to will be able to understand you unless the phone is a few inches from your mouth.Forget about laying the phone down in your car or on your desk and talking. Another downside is the incredibly crummy ring tones this phone comes with.There is not a single normal sounding ring tone.you can't set your phone to a default "ring ring. "Literally every single ring tone is some kind of wierd futuristic song. With the exception of the Nokia tune, none of these songs are common songs like the William Tell overture or Beethoven's 5th. They're all wierd songs that sound like noises that should be coming out of a robot.If you wear a suit to work, you probably want to set your phone on vibrate to avoid the stairs of your co-workers when someone calls you and your phone starts playing "Electric Eel" or "Futuristico. "The other problem is that half of these tones start out softly or very slowly, so they're not very practical as ring tones.By the time the melody of the song starts and gets loud the person wil have hung up. Lastly, the power-off button on the phone is almost impossible to use.I don't ever cut off my phone so it's not really a problem, but if you like to a lot, make sureyou have long fingernails.This is great for me because it prevents my phone from acidentally cutting off, but when I do need to use it, I actually have to use a letter opener or my keys to depress the button and activate it. Despite these design flaws, I really am very satisifed with this phone and won't mind using it for another year until my contract is up.If you are a Suncom or AT&T customer and are currently thinking of a new phone, I would recommend upgrading to one of the better models that both of these plans now offer so you can get something that can use the Nokia PC Suite. The phone doesn't synchronize with Outlook like my 6360 does.Now I have to enter my calendar by hand.It also doesn't have a decent ring tone that sounds like a real phone - how embarassing and unprofessional.The color screen is okay, but I'd rather have my calendar synch back and a ringtone that doesn't make me look like a child. With the introduction of its striking 8260 digital phone, one of the hottest new handsets on the market, Nokia sets a new standard for eye-catching style and extreme portability. Great looks by themselves don't make a phone, but the 8260's style does not come at the expense of substance. We were impressed with its robust construction, nice fit and finish, and easy-to-navigate controls. The 8260 also boasts dual-band/trimode electronics, a newly designed internal antenna, excellent talk and standby times, and a host of sophisticated functions including e-mail and two-way SMS capabilities. The only real missing feature is Web-browsing support. Where did this tiny phone come from? Essentially, Nokia updated the electronics and boosted the antenna power of its high-end classic, the 8860; put the new design in a sleek, tiny package; and significantly lowered the price. The 8260 also borrows the easy navigation and ease of use that is a hallmark of its popular 5100-series phones. Although many of the 8260's features are available in other premium phone models, its design is like nothing you've ever held. Weighing a mere 3.4 ounces and measuring 4.1 by 1.75 by 0.75 inches, the 8260 literally fits in the palm of your hand. The side-mounted volume-control keys were easy to operate while on a call, and we hooked up a hands-free kit to the headphone jack so we could stow the phone in our pocket while having conversations. One caveat: the tiny power button, located on top of the phone, is almost flush with the casing and hard to find. You won't be likely to turn the phone on inadvertently, but at times it was a challenge to turn the phone on at all. Other than this quibble, the 8260 is a joy to use. Three buttons handle most of the menu navigation: a roller-bar navigation key lets you scroll through menu options, and two additional buttons let you select menu options as they appear. The right prompt button also provides one-touch access to your phonebook. 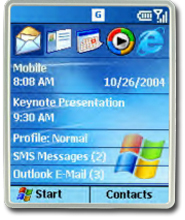 The top-level menu choices are: Messages (SMS and voicemail alerts), Call Log, Profiles (so you can choose how your phone behaves in different environments), Settings (for calls, phone, and security), System (so you can select a service provider or opt for automatic selection), Games (Rotation, Memory, Snake, and Logic), Calculator, Calendar and Keyguard Lock. The backlit, three-line display works well with the control keys, and we found it easy to locate menus and make selections. Despite the phone's small size, the keypad is well spaced, and we had no problems dialing with one hand. The Nokia 8260 has a full roster of call and messaging features. If offered by your service plan, it supports caller ID, call waiting, two-way SMS, voicemail, numeric paging, multiparty calling, and e-mail. Three different call logs maintain the last 10 dialed numbers, 10 most recently received calls, and 10 missed calls. PIM functions include a clock, currency converter, calculator, calendar with room for 50 appointments and reminders, and a 250-entry phonebook. There is no standard method of connecting the 8260 to a PC or other device. A few more cool things worth noting: The 8260 has three-NAM capability, so you can route three different numbers to the phone. Its built-in vibrating alert guarantees you will get your calls without annoying the people sitting next to you. And we have to mention Nokia's new game, Rotation. Most phone games are pretty lame, but this organizational puzzle can actually raise your pulse. The 8260 offers four basic security features: An initial security code, keypad lock, call restriction modes, and a lock code that can activate or deactivate memory and menu options. One nice thing about the lock-code feature is you can store numbers in a secret unlocked location, which will allow you to make calls even if the phone is locked. The 8260's lithium-ion battery is rated to last for a maximum of 210 minutes of digital talk time and 192 hours of digital standby time. In our battery testing (using the 8260 with AT&T service), it came impressively close. We held an open call for just over three hours, and the phone lasted for nearly eight days in standby mode. These are impressive numbers for any phone, but especially for one of this size and weight. MY HUSBAND ACTUALLY HAS THIS PHONE AND EVERYDAY ALL IHEAR IS, " I JUST WANT TO THROW THIS PHONE INTO A WALL." THE BATTERY LIFE IS TERRIBLE AND BOTH THE EXTERNAL AND INTERNAL SCREENS ARE GONE. OF COURSE SPRINT CAN DO NOTHING ABOUT IT AS USUAL. HORRIBLE CUSTOMER SERVICE. no belt clip neededfor this phone. I have had no problems with this phone.I use it quite frequently and have had no problems with it.I think if you take care of the phone and use it in a normal fashion, the phone will last as long as any other phone, and I have tried a lot of phones!The flip phone is great as it allows you to save the life of the key pad.I would reccomend this product, and feel very comfortable in doing so.I think most of the problems arise from the carrier and how helpful they are in correcting problems.Choose the right company and you will be happy! I chose a wireless carrier with a Month-to-Month option and can cancel service anytime without any cancellation fees.Maybe that's the way to go. Compatible with T-Mobile cell phone service, the Samsung V205 GSM phone sports a swiveling built-in color camera, a WAP Internet browser, and plenty of phone and organizer features, all displayed on an easy to read, 128 x 160 pixel, 65K color TFD main display with 20480 lines of resolution. Used simply as a phone, the V205 benefits from a 5-way scroll key for easy menu navigation and dialing. Primary calling features include incoming call display on the external screen, multiparty calling with soft key privacy switch, 40-instrument polyphonic ring tones, a handy voice mail button, speed dial, call waiting and forwarding, call timers, redial, any-key answer, roaming indicator, phonebook look-up, phonebook scroll, mute control, no-answer transfer, usage alert, differential ring, and a 500 entry phone book. Access to the wireless Internet lets you download new ring tones, games, multimedia messages, and send and receive photos to and from your phone or PC. SMS two way messaging provides sending, receiving and storage of text messaging with multimedia attachments. Organizer features include a PIM (Personal Information Manager), alarm, and a scratch pad. The petite T720i fits in a pocket but still offers some big features, such as a large, color screen; GPRS data transfer that supports EMS, SMS Chat, and MMS; and downloadable games, graphics, and ring tones. Possibly the most exciting feature of the T720i, however, is the included digital camera attachment, which lets you take photos from the phone itself and wirelessly send picture messages. This phone has a sleek metallic gray exterior and a delicate clamshell design that requires a little more care than Motorolas more rugged phones, such as the V66. When the cover is closed, an external LCD screen conveniently displays the date, time, and caller ID, plus signal and battery strength. When the flip phone is opened, the stunning 4,096-color screen is revealed. The 7- to 9-line screen is a large enough palette to take advantage of some of the phones key features, such as viewing photos, surfing the Web, or playing rich Java 2-powered games. (MotoGP is included, but more are downloadable from Motorolas Web site.) A button centered just under the screen takes you to the main menu, which has an intuitive iconic interface. This button is flanked by two other navigational buttons and another round, multi-directional button below helps you navigate through the menu or get right into four different features from the main screen according to your preference. Buttons are well-spaced but the multi-directional joystick-like button was a little bit difficult to control, even for small fingers. The T720i was one of the easiest phones to set preferences for that weve encountered. We programmed all of our buttons to go to the features we used the most and found it very handy. In addition, we customized the color of the main screen to pacific blue, a color choice that offered the best contrast, and set our screen saver to an EMS file of a devil. For our ring tone, we chose Deep Purples "Smoke on the Water," which, with the rich harmonies of polyphonic ringers, sounded almost like the original. The phone comes loaded with 50 different ring tones, so you can choose a more conservative ring or download additional choices. The sound during calls was a little bit tinny but not overly so. Our tests of the voice-activated dialing proved excellent. We recorded the name of our contact with a child screaming in the background and the phone still detected the contacts name later in a quiet room and dialed her number. The 720i holds up to 500 phone book entries, which is a large amount for the average caller. However, phone numbers and email addresses for one contact are stored as separate entries, filling up those 500 slots much more quickly. While a small letter icon designates which of your two entries is the email address, we still found it confusing. We sent a text message from the 720i to a friend from our address book and got a quick response, confirming that data transfer was fast. Inputting the message was tedious, but the phone includes a handy list of 10 Quick Notes with common text phrases, such as "Where is the meeting?" and "I am late and will be there in __ minutes." You can even compose and save your own phrases to save time on keying them in. The hot feature on this phone is its ability to take photos using the camera attachment. The picture-taking feature seems more fun than functional, but might be appealing for professionals such as home inspectors or insurance adjusters who need a cell phone and lightweight camera for their work. The camera snaps onto the bottom of the phone and has an 180-degree rotating lens to photograph everything from shoes to sky and store them as jpeg images in 640 x 480 resolution. It stores up to 48 pictures at a time, which you can then e-mail to friends or view on the T720is color screen as a photo album or slideshow. The only downside is that the digital camera shares memory with other digital applications on the phone, so storage space is limited. DOUBLE-CHECK with your carrier BEFORE you commit yourself to one. Needless to say, get whatever assurance of same in w-r-i-t-i-n-g. This way, you have a leg to stand on should you opt to terminate. 2003 CES Innovations Award Winner (for what that's worth...). Attach the optional digital camera to your phone and let your pictures do the talking! The Motorola T720i proves that the best technological innovations carefully balance excitement and fun with convenience and simplicity of use. For use on GSM 1900 MHz networks. Featured Accessory: Customizable headset - sold separately. 01 Network and subscription dependent feature. Not available in all areas. 12 Designed to synchronize with basic features of the initial release of many popular Personal Information Management (PIM) software and hardware products. 21 All talk and standby times are quoted in Digital Mode, and are approximate. Battery performance depends on network configuration, signal strength, operating temperature, features selected, and voice, data and other application usage patterns. *Allows you to enable Microsoft Word to activate iTAP Predictive Text Entry to improve speed and ease of text input on Phonebook, Datebook, and other ares that require text input. iTAP only requires one key tap per letter and will automatically complete words with fewer keystrokes. *Dimensions: 3.5" x 1.9" x 0.8"
1 Some services may not be available outside the U.S. Nextel National Network. The battery on this phone works normal for 3 months.After that you have to continually replace this phone.In my 1 year contract I replaced this phone 3 times.The last time I just gave up and borrowed a friends phone.Don't get this phone!!! You can replace the battery in the Motorola C332 phone. Remove the case front and back, then using a T 6 screwdriver remove the 6 screws holding the inside assembly together, carefully remove the screen and circuit board (all one piece)from the inside assembly. The battery unplugs just like in a cordless phone. Very carefully unplug the battery. The thinpiece of plastic on the back of the battery should be used on the new battery. A new battery can be purchased from YescomUSA.com part # BTMOTC332L. The Motorola C332 was my first phone and lasted about 18 months. I was 17 when I got it, and LOVED the look -- it's adorable and small! Unfortunately, the phone is completely low quality! The ringers were WAY too soft to hear -- I missed so many calls because I couldn't hear it...even when in the same room! Dropped calls became second nature...I would normally be dropped after about 14 minutes of talk time, which was annoying. During conversations, there was also much background noise, which I do not hear with my dad's much more reliable Motorola V60! Now, the phone is 18 months of age and I will be buying a new phone. The battery lasts a total of 8 minutes now before beeping at me with a low battery warning. Unfortunately, the internal battery cannot be replaced, so I am forced to spend money on a brand new phone. I hope my next phone has louder ringers and doesn't drop my calls! The phone is easy to use and cute, but there is a reason it was withdrawn from the T-Mobile shelves. Cute phone, loooow quality. Too bad! You can't replace the battery, and it would be at the first bar after a full charge the first day I got it. It will give you 20 minutes talk, tops, and that's brand new. 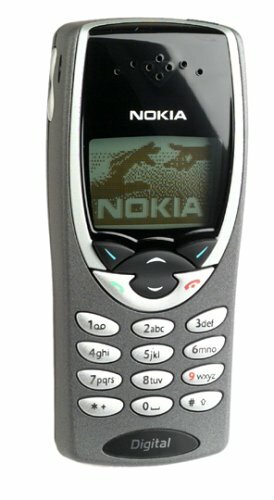 I finaly gave up and bought a cheap Nokia 3595. What a treat! T-Mobel has been good to me, and only charged me $20.00, with a 1 year contract extension. T-Mobile I recomend anyway. I travel a lot, and found reception even in Puerto Rico, when others did not. Good phone.But had ordered mine off of Nextels site. They even gave me a code that saved me $50.00. Here it is for you all to share (CL897L) case sensitive. On the shopping cart page. It is like an invoice thing. But I think it is a very good choice. You will enjoy the phone.